Description: Jolly Jumper is a jolly wooden frog with great big eyes! When pulled, Jolly's eyes roll, his back legs flip-flop around, he makes a jumping motion, and he makes a realistic "croak-croak" sound. FPT4206 - Wooden cut-out frog with paper lithographs on the sides and edges of a green frog with black spots on his back. The frog has two round black wooden eyes with white painted iris on each eye. 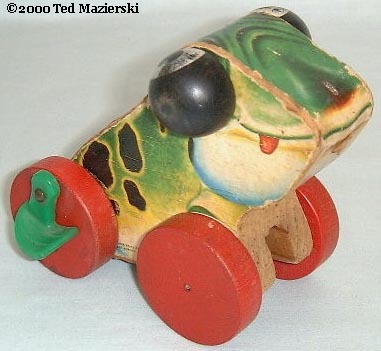 The frog rolls on 4 red wooden wheels. The back two wheels have green plastic rear legs attached that flip-flop around when the frog is pulled. He also makes a "croak-croak" noise and his googly eyes roll around when pulled. Measures 6" long, 4" wide, 4-1/2" high. 1954 original retail price was .75¢ in the East and .85¢ in the South and West. Also see 1956's #464 Grand'pa Frog.